Cooked food centers offer delicacies at affordable prices, writes Christopher De Wolf. The decor consists of handwritten menus and beer posters taped to the wall. The lighting is a harsh fluorescent glare. There's a constant din from the kitchen. No matter: It's Saturday night and the Bowrington Road Cooked Food Centre is packed. At one table, a family shares a steamed fish and a bottle of wine. At another, a group of middle-aged men down large bottles of beer while playing a noisy game of dice. When one of the players notices some other diners observing the game, he holds up his beer and offers them a toast. Tucked inside the top floors of neighborhood wet markets, invisible from the street, Hong Kong's cooked food centers are an odd cross between a shopping mall food court and a streetside dai pai dong. And despite their clinical-sounding names, many of them have become destinations for hearty, boisterous and affordable meals. Though it's "loud, not particularly clean and a bit uncomfortable," the attraction is the combination of good food and a lively, informal atmosphere, he says. Even more appealing is the sense of stumbling upon a particularly well-hidden secret, which has made cooked food centers a cherished hunting ground for food critics looking to impress their audiences with new discoveries. When the American food adventurer Anthony Bourdain took his television show No Reservations to Hong Kong in 2007, one of his stops was at Tung Po, a seafood restaurant in North Point's Java Road Cooked Food Centre, where he praised the deep-fried mantis shrimp and squid balls soaked in black ink. Many centers are home to a star restaurant that draws customers from across the city. "A lot of diners in Hong Kong are very adventurous," says BonVivant. "They like to try new things, especially if there's a gimmick." At the cooked food center in Kowloon City, it's Amporn Thai Food. In Tai Po, it's old-fashioned dim sum at Lam Kee. In the shabby market tucked under a bridge on Haiphong Road, in Tsim Sha Tsui, savvy diners come for Tak Fat's beef balls. The secret to the centers' success lies in their affordability. The first cooked food centers were built by the government in the 1970s to house hawker stalls and dai pai dongs that had been cleared from the street. A majority of them were built in industrial areas "to provide low-cost catering services" to workers, according to a spokesman from the Food and Environmental Hygiene Department, which operates the facilities. Eventually, more centers were built across the city, evolving from rudimentary collections of food stalls to more elaborate air-conditioned halls. 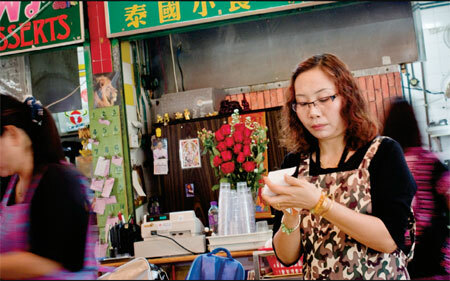 There are now 64 cooked food centers with 930 stalls across Hong Kong. Rent for a cooked food center stall is determined by public auction, with the starting bid depending on size, layout and location. The most expensive stall currently rents for HK$60,000 per month; the cheapest is just HK$300. The low start-up cost is what appealed to Joe Lau, the former bar manager of M at the Fringe, a well-regarded fine dining restaurant that closed last year. He now runs ABC Kitchen, a restaurant in the Sheung Wan Queen Street Cooked Food Centre that serves French- and Italian-inspired food like roast suckling pig, risotto and creme brulee. "At first I thought about Soho or Gough Street, but they were too expensive," he says. One day, though, he had lunch with a friend in the cooked food center. They noticed a vacant stall. "He said I should open a shop here," says Lau. "It was good for me because I don't have a lot of money, and if you open in Central, you need two or three million for a place with 50 seats." As it happened, the vacant stall was up for auction, and Lau put in a winning bid of HK$15,000 per month in rent and management fees. His total start-up costs were HK$300,000 - one tenth the cost of opening a standalone restaurant. With tables covered in red-and-white checkered cloths and set with wine glasses and Western cutlery, ABC stands out from its more typical Chiu Chow, Indian and Thai neighbours. His goal for ABC, he says, is to serve affordable fine-dining food in a casual atmosphere. "If you go to CitySuper to buy 60 grams of foie gras, it would cost almost the same as us, and they don't even cook it for you," he says. "I can keep my prices reasonable because I don't need to pay much for rent or decoration." 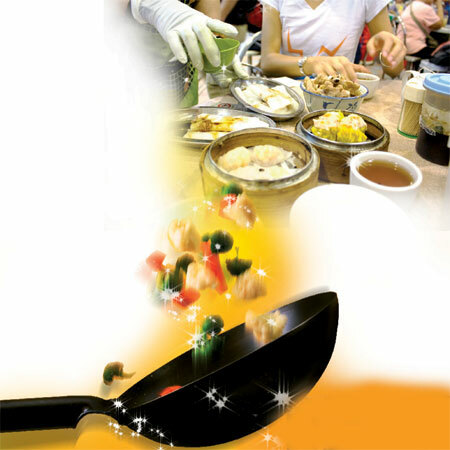 Business was slow until a food critic, who goes by the name HKEpicurus, reviewed ABC on OpenRice. "There was absolutely no one there - I ate by myself," he says. "It was a new experience for me, having that kind of food in a cooked food center." After he published a glowing review, more and more customers came, and ABC has become busy enough that customers need to make reservations to get a seat at dinner. Across town, in the Kowloon City Cooked Food Market, Amporn Thai Food is full to bursting on a Monday night. Dozens of families, young couples and friends chatted loudly over plates of pork neck salad and tom yum soup. "We saw some of the cooked food centers on a TVB food show and decided to give them a try," says one customer as she finishes a meal with her husband and two young children. "The shrimp cakes here are really good. We'll definitely be back."